Pool Made with Paper and Blue Ink for Paper Pool, signed, dated ’80, and numbered in pencil 475/1000, lithograph in colours, on Arches Cover paper, published by Tyler Graphics, Ltd., Mount Kisco, New York, 26cm x 22cm. Provenance: With Goldmark Gallery, Uppingham. The last lot in the picture section was an artist of international fame but who’s work is rarely seen in salerooms outside of London or New York. 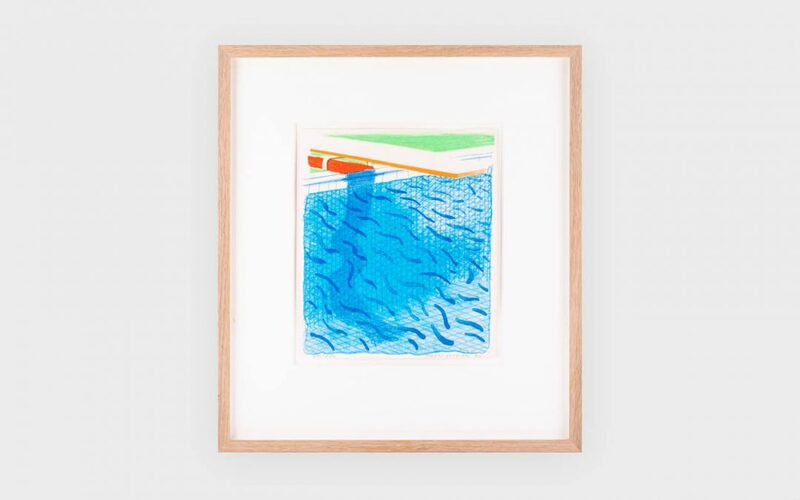 Offered was a signed limited edition of David Hockney Pool Made with Paper and Blue Ink for Paper Pools, arguably one of the most iconic images of the Paper Pool series, which focused on the Californian pools Hockney first experienced in late 1970s Los Angeles. This work, offered by a private collector who acquired it from the Goldmark Gallery in Uppingham, continued the trend of this image rising in stock in the very recent past. As recently as September 2017, the London rooms sold examples of this edition with hammer prices of £13,500 and £16,000. Since then a handful of results both sides of the Atlantic have rocketed, taking the work to in excess of £20,000. With dedicated bidding between both The-Saleroom.com and Invaluable live bidding platforms, the final say on this occasion fell to The-Saleroom client for a hammer total of £21,000 (£26,375 inclusive of premiums and ARR). The book section was mostly comprised of two private libraries of a very different nature. One of a more traditional focus of antiquarian books, the other of 20th century illustrated works, principally focusing on the illustrator Arthur Rackham. Every lot of the Rackham collection sold, demonstrating the much-celebrated illustrator’s popularity is still strong, with the top lot being really rather special. In 1931 Rackham and the publishing house he is most commonly associated with Geoge Harrap & Co, London, printed a deluxe edition of just 12 copies of Izaak Walton’s The Compleat Angler. They were bound by the very best – Sangorski and Sutcliffe – and within the beautiful red morocco binding the subscriber was treated to twelve colour plates by Rackham, but crucially a unique watercolour by the artist as well. Scarcity value of such a rare work pushed two bidders to £10,000, which was not too short of the retail value paid for the book when purchased in 2012 from a specialist London dealer. Part two of a fascinating collection of Staffordshire pearlware started the sale, and the dedicated collectors were back in town to acquire some of these rare English creations from the 17th and 18th centuries. The charm and whit shown in these ceramic groups can surely only have been made by the Englishman at his creative best. The top price on this occasion was for lot 36, a lady riding side-saddle escorted by her hound, selling £1,800. However the Europeans produced the top result in the ceramic section with something equally as distinctive in a large example of the classic Meissen figure, Count Bruhl’s Tailor. Rarely seen on such a scale (this stood at 44cm), a European buyer took it for £7,000, despite heavy losses and damage. A small but certainly not diminutive Jewellery and Watch section attracted a good audience for some very individual and distinctive pieces of jewellery. With something for everyone, the top lot “For Him” a near-new Jaeger le Coultre Reverso Duoface wristwatch with 18ct gold case, selling for £4,600; and the top lot “For Her” was a 3ct brilliant cut diamond solitaire selling for a cool £9,500. Surely the most intriguing lot was a late entry – 88A – that you could be forgiven in thinking was something from the fruit and veg aisle and costing a matter of pence. Instead what was before our eyes was an exceptionally naturalistic carved and stained ivory banana from Japan in the early 20th century. Realising £1,100, it has to be one of the most expensive pieces of fruit in town!